This sailed straight into number one in the UK three weeks ago and it's solidly staying put. Adele has promoted this song so much it's unsurprising it impacted the charts this way, managing to be number one in 26 countries so far, with an amazing vocal what do we expect? 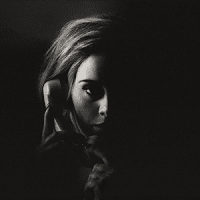 Adele performs beautifully with an understanding narrative. Adele is truly back! Adele, real name Adele Adkins, had writing block when it came to this song, however she managed to come back and complete it. She has one of those voices that would sound good singing anything, it has been trained to perfection. The song was co-written with Greg Kurstin. Surprisingly the song isn't about a relationship, although that is what many may interpret it as, but instead is about how everyone is getting older and moving on with their lives, and she wanted to sing a song they will hear, and understand. Vocally amazing, I can't help but fall in love with this song even though I am not at all an Adele fan. The video was directed by Xavier Dolan, which is based off his semi-autobiographical film J'ai Tué Ma Mère (I Killed My Mother). It was filmed at a farm in Québec and features actor Tristian Wilds (most known for playing Dixon Wilson in 90210, I knew it was him as soon as I saw him). The start launches into Adele phoning someone and not getting through, having no signal. She pulls curtains down and dusty covers. She has clearly come back to revisit the house of her past. I love the cuts that intersperse of Tristian Wilds, showing us the past and of the relationship she once had. We all daydream of our past relationships don't we? And how they all went wrong. Instead of a black & white filter, we have a sepia filter instead, this is mildly better, but still a no-no, it adds very little depth into this video, but I can see why it is used. Overall not a video I would enjoy watching again, however it looks like it's going to stay atop of the charts so the video is probably playing constantly on music channels, so I'll probably come across it once again. I can't say much bad about this video, other than it is unsurprising and expected. Nothing new, nothing great and nothing to make me go wow. But with a vocally amazing song like this, the video doesn't have to be any of those things.